(Phys.org) —Nearly all electronics require devices called oscillators that create precise frequencies—frequencies used to keep time in wristwatches or to transmit reliable signals to radios. 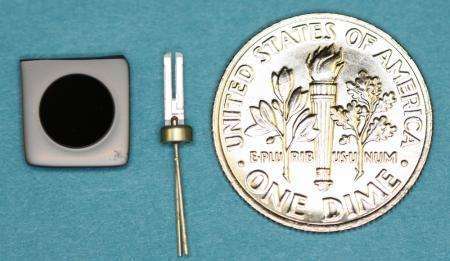 For nearly 100 years, these oscillators have relied upon quartz crystals to provide a frequency reference, much like a tuning fork is used as a reference to tune a piano. However, future high-end navigation systems, radar systems, and even possibly tomorrow's consumer electronics will require references beyond the performance of quartz. Now, researchers in the laboratory of Kerry Vahala, the Ted and Ginger Jenkins Professor of Information Science and Technology and Applied Physics at Caltech, have developed a method to stabilize microwave signals in the range of gigahertz, or billions of cycles per second—using a pair of laser beams as the reference, in lieu of a crystal. Quartz crystals "tune" oscillators by vibrating at relatively low frequencies—those that fall at or below the range of megahertz, or millions of cycles per second, like radio waves. However, quartz crystals are so good at tuning these low frequencies that years ago, researchers were able to apply a technique called electrical frequency division that could convert higher-frequency microwave signals into lower-frequency signals, and then stabilize these with quartz. The new technique, which Vahala and his colleagues have dubbed electro-optical frequency division, builds off of the method of optical frequency division, developed at the National Institute of Standards and Technology more than a decade ago. "Our new method reverses the architecture used in standard crystal-stabilized microwave oscillators—the 'quartz' reference is replaced by optical signals much higher in frequency than the microwave signal to be stabilized," Vahala says. Jiang Li—a Kavli Nanoscience Institute postdoctoral scholar at Caltech and one of two lead authors on the paper, along with graduate student Xu Yi—likens the method to a gear chain on a bicycle that translates pedaling motion from a small, fast-moving gear into the motion of a much larger wheel. "Electrical frequency dividers used widely in electronics can work at frequencies no higher than 50 to 100 GHz. Our new architecture is a hybrid electro-optical 'gear chain' that stabilizes a common microwave electrical oscillator with optical references at much higher frequencies in the range of terahertz or trillions of cycles per second," Li says. The optical reference used by the researchers is a laser that, to the naked eye, looks like a tiny disk. At only 6 mm in diameter, the device is very small, making it particularly useful in compact photonics devices—electronic-like devices powered by photons instead of electrons, says Scott Diddams, physicist and project leader at the National Institute of Standards and Technology and a coauthor on the study. "There are always tradeoffs between the highest performance, the smallest size, and the best ease of integration. But even in this first demonstration, these optical oscillators have many advantages; they are on par with, and in some cases even better than, what is available with widespread electronic technology," Vahala says. The new technique is described in a paper that will be published in the journal Science on July 18.